Our church takes special interest in its children and especially preschoolers. We strive to provide opportunities for the community and our members to find positive activities to get kids involved and learn about Jesus. Bible Study Classes are provided for preschoolers at 9:00 a.m. and 10:15 a.m. Each Sunday during Bible Study preschoolers explore various learning centers using their five senses to learn biblical concepts. Through hands on teaching, a child is guided through an activity toward a biblical truth that can be understood and applied on their level. While preschoolers attend Bible study, parents are free to worship and attend an adult Bible Study class. On Sunday evenings from 6:00 - 7:30 p.m. AWANA clubs are provided for preschoolers. 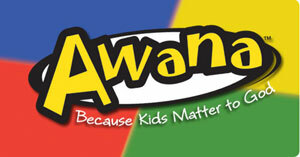 AWANA is a Bible based club that consists of three parts: game time; Bible lesson and handbook time. Preschoolers can join the club at any time. AWANA Clubs are held from August through May. Mission friends meets from 6:30-7:30 p.m. on Wednesday evenings. Preschoolers are taught about missions and that God loves everyone. The same subject areas and activity centers which they are accustomed to on Sunday morning and evening are used during this time.